The day-going spring-driven movement is constructed between vertical straps and consists of three trains. 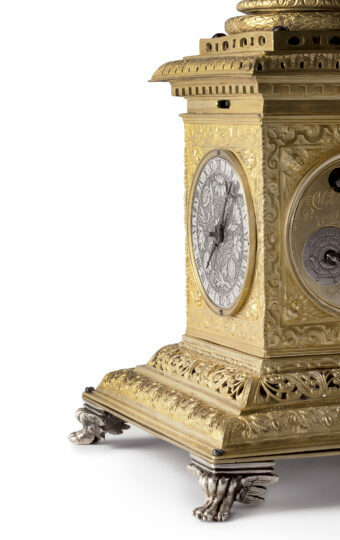 The going train has a fusee and a vertical verge escapement with balance. The striking works are controlled by count wheels. 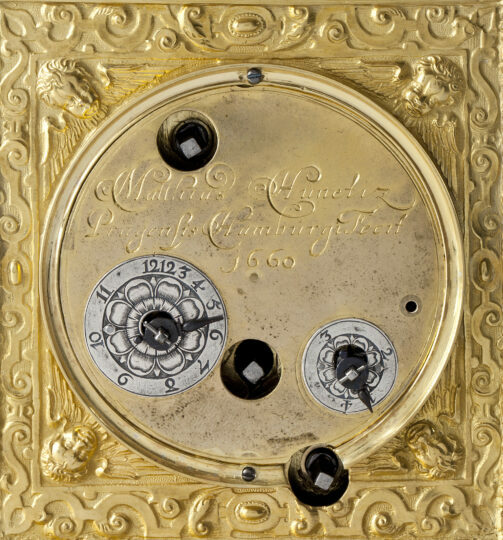 The hours are indicated fully on one bell, the quarter-hours on two bells, which are situated on the underside of the movement. 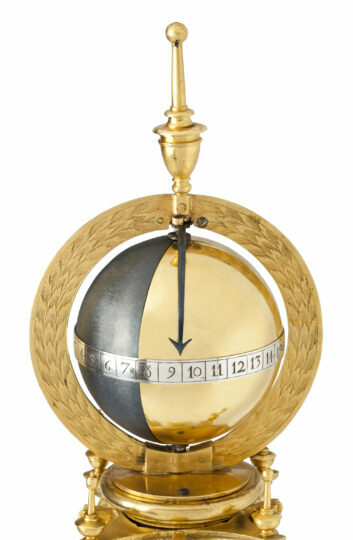 There is a mechanism in the steel column connecting the movement with the sphere, which has a dark blued-steel side and a light gilt side showing the phases of the moon. 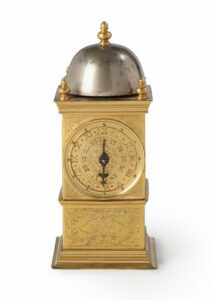 There is a silver band with Arabic numerals and a fixed hand showing the moon date. There are three silver dials on three sides. 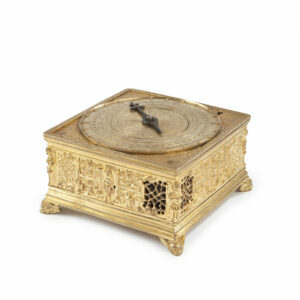 That on the front shows the time on a Roman and Arabic chapter ring with quarter-hour and minute divisions. The dial on the left-hand side indicates the date in Arabic numerals, whilst that on the right-hand side has a 24-hour division (twice I – XII). 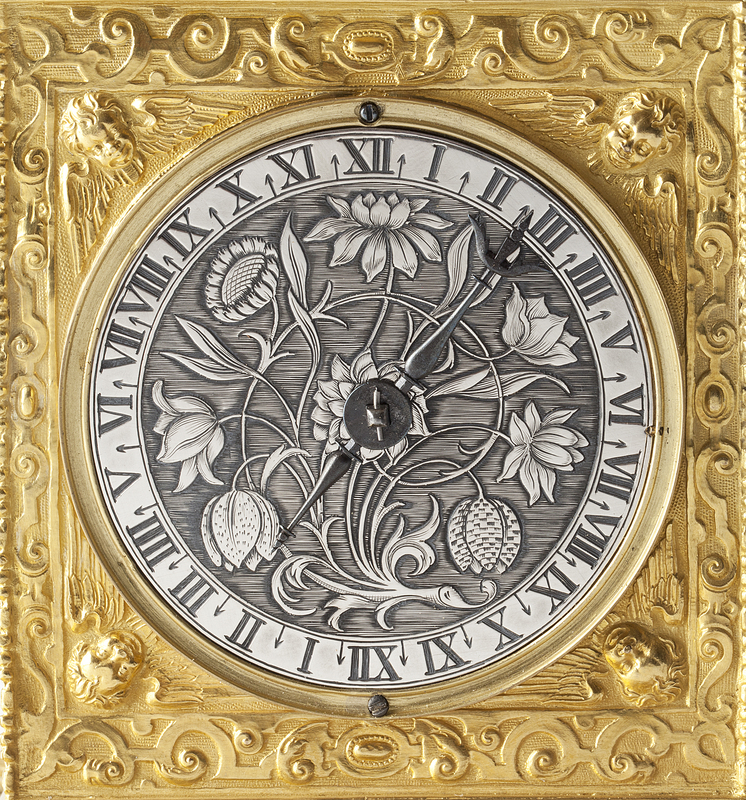 The clock is signed here Matthias Hünetiz Pragensis, Hamburgi fecit 1660. The slide above the chapter ring is the regulation control for the going train. The three dials all have blued-steel hands and a counter-engraved middle with flower motifs. The rear side of the base has two dials indicating the last hour and quarter-hour struck respectively, each with a blued-steel hand. Here there are also three winding holes. 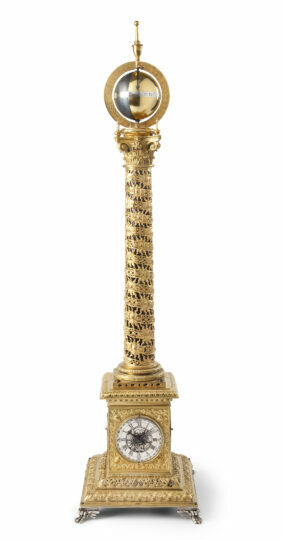 The fire-gilt case consists of a blued-steel pillar on a base with a sphere at the top. The base is richly pierced, chased and engraved in various motifs, such as acanthus leaves and winged-cherub heads, whilst the column has spiralled bandwork in relief. 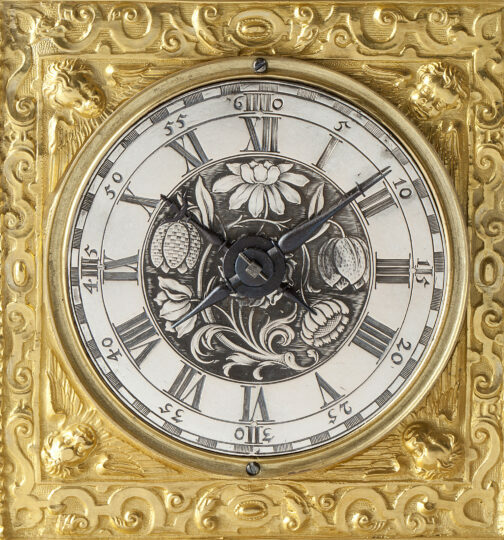 The motifs in the embellishments are the ornaments on a chain of the Order of the Golden Fleece: linked burning flints and fire steels hitting each other. The encircled sphere, depicting the moon, is surmounted by a finial. The lower part of the base is stepped and has sound frets all around. The whole rests on silvered claw feet. 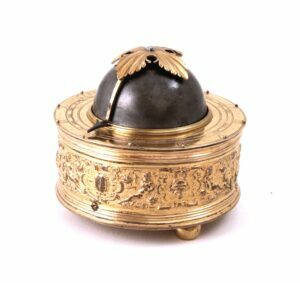 The maker, Matthias Hunetiz, was originally from Prague, as the signature suggests, and active in Hamburg in the middle of the seventeenth century.